Comments: William Day Smith served as principal of Scottsville School for 30 years (1907-1937). Under his leadership, Scottsville High School became the first Virginia high school accredited by the University of Virginia and the State Department of Education. William Day Smith was a beloved classroom teacher and wrote the lyrics to "The Scottsville School Song." A quiet Yankee from Massachusetts, Smith also was an excellent skater who gave lessons on the ice at Miss Hannah Moore's Bottom. According to his niece, Katherine (McFarland) Ellis of Scottsville: "It was a joy to have grown up around William Day Smith. His life seemed to revolve around young people and their education, though I must say that the way he taught was painless for the recipient. Mr. Smith was a botanist, a naturalist, an herpetologist, a Latin scholar -- many other things, but above all, he was a teacher. It was his theory that if a child did not learn, it was the fault of the teacher -- not the student." "Mr. Smith was a noted authority on ferns and often was consulted by some of the faculty at the University of Virginia. To be taken on a hike through the woods with him was an education in itself because he knew the name and habits of every wild flower that grew. He thought that wild plants should be left alone -- not dug up and taken away from their natural home." "Mr. Smith encouraged his students to participate in sports. When 'Rally Day' came around and the Albemarle County schools got together to compete in various games, he was always there to cheer on his students"
"During the summer months, when Scottsville School was out, Mr. Smith taught at Virginia Tech to supplement his painfully small salary as Principal of Scottsville High School. Through his friendship with Paul Goodloe McIntire, Scottsville schools received a number of financial gifts which they otherwise might not have received. Mr. Smith did much to raise the level of education in Scottsville. Many people admired him and felt that the town was fortunate to have such an outstanding scholar." "Mr. Smith had one son and two daughters by his first wife. On June 3, 1910, he married secondly Annie Parker 'Parke' Harris, and from this union there were two children, Frances Crafton Smith and Charles William Smith." As one of his former students, Mayor Raymon Thacker remembers William Day Smith fondly: "Nicest man I ever knew. He was dedicated to the school and dedicated to every student that was in it. It didn't matter what your problem was, he would meet with you and help you if there was any possible way on earth he could do it. He was a very good and honorable man. I talked to Mr. Smith many times. I hated algebra and never did know anything about algebra. Mr. Smith said, "Raymond, if I were you, to get your points in, go on to geometry." "Alright, Mr. Smith, if you'll help me." "Yes, I'll help you. If you'll come to me after class, I try to straighten things out for you." "And so Mr. Smith taught me geometry, and we were great friends." "Morris Anderson had a Model A Ford coupe, and Mr. Smith borrowed it one day. I took him up to Crab Tree Falls. He loved horticulture, and it was springtime. We were looking for new plants around the falls. When we got up there, it was cold with freezing rain and sleet. It got so cold and icy -- we had to move the wind shield wiper by hand -- that the ice froze on the windshield. I couldn't see anything, and Mr. Smith hung his head out the window to get a better view. His moustache froze and stood straight out. And I had to laugh at him. We stopped in Steels Tavern to get warm and drink some coffee. I'll never forget that trip, and I told Mr. Smith, "Next time, let's wait until summertime comes before we go looking for new plants." "And the kids all loved William Day Smith. I don't think you'll find anyone who disliked him - he was a good man." In 1914, the "Primary School" was opened on a plot of land donated by Captain John Pitts. I think my father had considerable to do with the acquiring of this site. In this building of two rooms was housed the first three grades; Grades One and Two were held for only half a day. This new building also had running water and flush toilets. About 1922, water was piped into the building on the hill from the reservoir which was slightly higher that the school. There was a drinking fountain and water in the home economics room for the kitchen. Soon the principal had a shower installed on the ground floor, below one of the class rooms. This was much appreciated by the boys sports teams. Efforts were made to improve the looks of the building, and I can remember having class competition on "Clean-Up Day." The winning class got the afternoon off! It was a difficult climb to the old school house, and about the only who rode was Mrs. Bessie Davis, who was fourth grade teacher then and for many years afterward. Athletics was a big thing at S.H.S. in the 1920's. Basketball was especially important, and both boy's and girl's teams frequently held the county championship. There was also baseball and some track, and when Rev. Walton was there, S.H.S. also had a drill team. There were other activities as well, such as music, spelling, and public speaking. Another thing that came to Scottsville were the Chautauqua programs. With help from the Chautauqua Foundation, many of the S.H.S. pupils spent time for about a week each year preparing for a program to be presented down in Victory Hall. Victory Hall was built about the time of the end of World War I. I always understood that part of the money for that came from Lady Nancy Astor, who was a Langhorne from Albemarle County. During most of this period, the Albemarle County Superintendent was A.L. Bennett, and our local representative on the Albemarle County School Board was Dr. J.P. Blair. With some more planning and probably assistance from the county, the new high school was built near the Primary School and opened in 1925. The central part of the building was a study hall and assembly hall where the whole school assembled each morning for the Bible reading and Lord's prayer. There were about six or eight class rooms on the main floor. The sciences and home economics classes were housed in the basement. S.H.S. had a good reputation and in the late twenties, a number of pupils from surrounding counties boarded at Dr. Dillard's home during the week and attended S.H.S. for several years until their graduation. During this period, our school competed successfully in Spelling, in Choral contests, and speaking, as well as being a top contender in athletic events, including the spring track meet at the McIntire Field in Charlottesville. Earlier, there had been an "Honor System" initiated in the high school by the principal. Another thing which was in existence about this time was an attempt to provide a hot lunch (generally a soup) for a nominal sum for those children who did not go home to lunch. Mrs. Bell provided this service for awhile, and it was well accepted especially in the winter months. My father had always been interested in the early history of the town and had quite a collection of arrowheads and stone tools which he had picked up in the fields around Belle Grove. He had also tried to collect information about the canal days and the late nineteenth century. In 1937, the Senior Class, at Principal Smith's suggestion, had as its project the collection of information concerning the early history of the town. Grace Howard and Margaret Harris were two of the students who worked on this history project. This material is now housed in the Scottsville Museum. Several persons who had graduated from S.H.S. returned to teach in the school during the coming years. Among them were Laura Branham, Pauline Parr Mayo, Leslie Walton, and Katherine Pitts Phillips. S.H.S. during the time of William Day Smith provided a good education for a good many boys and girls in Scottsville. At the time of my father's resignation in 1937, Scottsville High School was the largest and most progressive school in Albemarle County. William Day Smith, principal of Scottsville High School for 30 years and outstanding botanist, died yesterday in Chester, Pa. He was 94 years old. Smith, a native of Abingdon, town of Pomfret, Conn., began his teaching career a year before his graduation from Amherst College in 1882 and continued until his retirement from his post at Scottsville High School in 1937. After his retirement, he resided on Washington Street here until recently. Before going to Scottsville, he was principal of schools in Port Jarvis, Sparrowbush, and Warwick, N.Y., for ten years and with his brother-in-law, headed a private school for boys at Bon Air. During his 30 years in the southern Albemarle school, enrollment jumped from 125 pupils to 500 and a new building was erected. A widely-known authority on ferns and wild flowers, he first became interested in this field of botany during his under-graduate years at Amherst. He later started a herbarium, which is the official ferns collection of the Virginia Academy of Science. He made the collection during his summers and accumulated 60 of the 72 recognized varieties growing within Virginia. He was official ferns expert of the Academy, and his collection is to be placed at the disposal of the Academy for use at the University of Virginia. His interest in plants also extended to wild flowers. 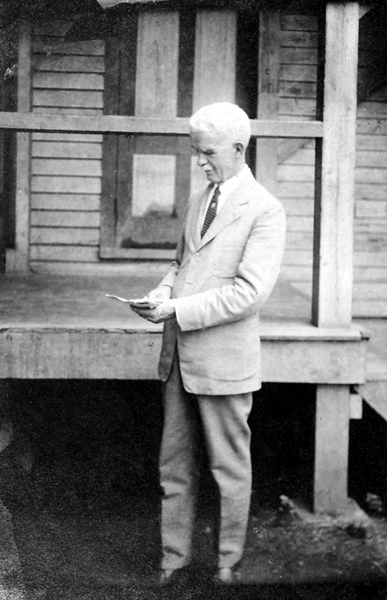 Dr. Ivey f. Lewis, retired dean of the University and former chairman of the School of Biology there, credited Mr. Smith with formulating plans for the University's summer biological station at Mountain Lake, established in 1930. Mr. Smith became a member of Phi Beta Kappa at Amherst College, where he received his A. B. degree in 1882 and his M.A. two years later. He was one of the last surviving members of the class of 1882. He was twice married -- in 1888 to Miss Eunice King Hazen, of Richmond, who died in 1907, and in 1910 to Miss Annie Parke Harris of Scottsville, who died last January. Surviving are two sons, Phillip K. Smith, of Butler, N.J., and Charles W. Smith, of Wilmington, Del., and a daughter, Mrs. John Justice of Chester, PA.
Funeral services will be held at 1 p.m. Friday from Hill and Irving Chapel, conducted by the Rev. David Burr, minister of the Charlottesville Presbyterian Church. Internment will follow in Hollywood Cemetery in Richmond at 3:30 p.m.